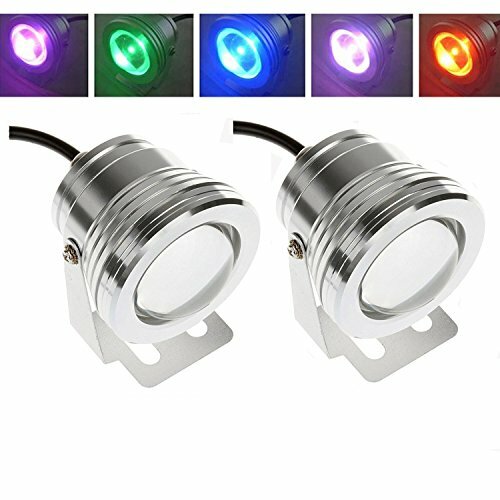 Powstro 2PCS RGB LED Underwater Fountain Light Lamp IP65 10W Spotlight Pool Pond Fish Tank Aquarium LED Light Lamp DC 12V | Fountain City Art Ctr. - Comes with LED bulb, 180 degree direction. - Fully submersible and perfectly sealed, waterproof spotlight adds a dazzle of color to your pond or fountain. - Can be mounted vertically or horizontally, Adjustable stand lets you point the light at different angles. - Ideal for aquarium, fountain or pond, illuminates and colors the aquarium, enliven the garden pond to get ideal atmosphere and beauty. Beam Range - 30-50m / 98-164"
Line Length - 33cm / 13"
EASY TO INSTALL - High quality. Super bright and long-lasting, easy to install.Support extension wire. LED UNDERWATER LIGHT LAMP - Fully submersible and perfectly sealed, waterproof spotlight adds a dazzle of color to your pond or fountain. ADJUSTABLE STAND - Comes with LED bulb, 180 degree direction. Can be mounted vertically or horizontally, Adjustable stand lets you point the light at different angles. BEST DECORATION LIGHT FOR UNDERWATER USING - Ideal for aquarium, fountain or pond, illuminates and colors the aquarium, enliven the garden pond to get ideal atmosphere and beauty. WHAT YOU WILL GET - Product includes 2*10W underwater LED light, 2*Remote control. We offer ONE YEAR warranty. Please feel free to contact us if there are any problems or questions. We are always glad to solve your problems or answer your questions. If you have any questions about this product by Powstro, contact us by completing and submitting the form below. If you are looking for a specif part number, please include it with your message.